For straight-line towing and vehicle recovery towing, CURT offers multiple tow hook options. Our bumper-mounted tow hooks mount onto the bumper of your vehicle and are a common accessory for pickup trucks, SUVs and 4x4s. 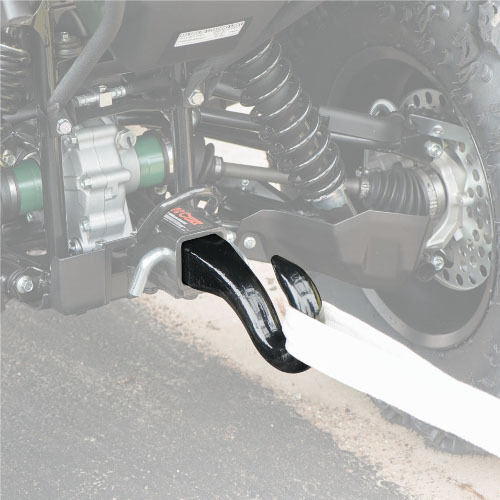 Made with forged, heat-treated steel, these tow hooks offer a capacity of up to 10,000 lbs. They are available in two finishes, including chrome and black powder coat. We also offer a number of hitch-mounted tow hooks that utilize the receiver tube of your front mount hitch or rear mount trailer hitch. We offer forged tow hook mounts, tow strap mounts, as well as ball mount and tow hook combinations. CURT receiver-mount tow hooks are perfect for everything from full-size pickup trucks to ATVs. They come in a variety of durable finishes, including our carbide black powder coat to provide corrosion, scratch and UV resistance. The CURT vehicle recovery strap is made from nylon and designed to be used in conjunction with our tow hooks or tow strap mounts. It features a gross vehicle weight capacity of 9,000 lbs. and a break strength of 18,000 lbs. It comes with two looped ends for easy attachment to a tow hook and has a 30' length. The vehicle recovery strap is more compact than rope and stronger and lighter than chain, making it easy manage and convenient to store in your vehicle.